A comfortable, warm, clean, beautifully decorated property within walking distance of Holyrood Palace, Arthur’s Seat and The Royal Mile leading to the Cathedral and Castle.Highly recommended. What a lovely place, enjoyed every minute. Great breafast. Thank you very much. We will recommend your house to everyone we know! Excellent stay here. Very friendly staff and the breakfast was great . Thank you for our enjoyable stay with you . Great location in the east end of the city &within easy walking distance of Playhouse theatre &Waverley train station.Hilary couldn't have been more welcoming &friendly, the garden room was huge, well appointed, very comfortable &extremely quiet. Breakfast was superb &parking was surprisingly easy (and cheap! ).I will definitely be back! We stayed for one night - beautiful room, comfortable bed and welcoming host. Breakfast was fresh and delicious with a tasty piece of haggis! Complimentary wine offered and was a great location for seeing the city. Booked for one night and couldn't fault it. Beautiful guest house, stylish &comfortable room. Helpful &easy going proprietor. All very easy and relaxed. Will definitely book again. Brunton Place is a lovely Guest House set in a very tastefully decorated and furnished Georgian house, it's in a good location for the City centre and train station etc.The owner is very nice and helpful, and the place has a lot of very nice little details that make it that bit more special. The breakfasts were very nice and comprehensive.The Bathrooms were fantastic, very high quality with good water pressure and plenty of hot water, shower gel, shampoo, towels etc.We stayed in the Courtyard Room on the lower ground floor, now we must be honest and say we found the room very small for two people, the room would be much better as a single room, I understand the Guest House has bigger rooms. Our room was also at the front of the building by the busy road, so we did find our room on the noisy side from traffic and passing pedestrians.If we were to stay there again I would ensure we had a bigger room at the back of the building. What a fantastic place to stay. Really nice interiors and feels very luxurious.Very tasty homemade breakfast too. I stayed for 1 night and found the room clean, with everything that I required.The breakfast in the morning was delicious and they are very accommodating for those who have to leave early.Great location, as it was close to the train station.Safe area! We truly enjoyed our stay in the garden roomClose to center city but just far enough away to be peacefulShould my travel plans in the future include Edinburgh this would be our first choice. Fiona was fabulous, super flexible even though we got in late and had to leave early. She even packed my friend a breakfast to go in the am so she could eat it at the airport for her early flight! Thanks for a great stay. Such beautiful accommodation in fabulous Edinburgh. We only had one night but wished we could stay longer. Accessible, every little touch provided, great breakfast &absolutely spotless and it felt like home.Hilary was such a lovely host to boot and highly recommend this B&B and exceeded our expectations. Small room but the owner ( Hilary ) is a fantastic host. Excellent breakfast. We thoroughly enjoyed our time at Six Brunton Place and will certainly stay again next time we are in Edinburgh. It was great to be able to live so comfortably and so conveniently while exploring the city. Hilary made us extremely welcome. 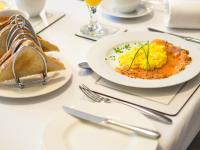 And our splendid breakfasts started each day in the best possible manner. We chose Brunton Place mainly because of the wonderful reviews written for Trip Advisor. We were not disappointed.The Guest House had changed hands a few weeks before we arrived and we were just as satisfied with our stay as previous customers had been before the change of ownership.Our room was warm, comfortable and welcoming and had every facility we could have wished for. The breakfasts were excellent, plenty of choice and eggs cooked to perfection in whatever form they took!Hillary was very helpful and kind and our stay with her was delightful.We would certainly stay there again and recommend it to our friends. Perfect balance between modernity,tradition and wellbeing.One of the best breakfast I've ever had abroad.All details very well planned. We stayed in the small double and found every detail well thought-out and first class.The vibe is a great modern take on Edinburgh and the areas that can be reached by walking offer a great mix of fun and entertainment.Great job! Stayed at 6 Brunton Place on the recommendation of friends who had stayed there last year and thoroughly enjoyed our stay. Convenient location, lovely house and very friendly service. Top class! Wonderful stay, room lovely, breakfast delicious very friendly and helpful proprietor. I thoroughly recommend this B&B guest house. Many thanks, this is our first time inEdinburgh and with the sun was spectacular. At that Six Brunton place guest house was a wonderful experience, Sue like a friend,always perfect many thanks again. a lovely Bed and Breakfast! We had a great stay. Wonderful breakfast and the room was fantastic. First time in Edinburgh and we would definitely come back to stay here. We had a warm welcome at Six Brunton Place. It has a very nice and luxurious interior. The host was very friendly and helpfull. 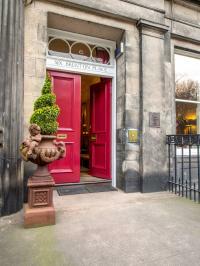 We are experienced travelers, and this was one of our best B &B experiences.Sue, the proprietress, was extraordinarily attentive and friendly.The location is excellent for exploring Edinburgh.We highly recommend Six Brunton Place. Our stay at Six Brunton Place was definitely the best out of our 5 days in Scotland.Everything was perfect and I wish I could come back to Edinburgh to stay at this guest house again! A brilliant find. Accommodation and service was simply outstanding and our hosts simply could not do enough for us. We will definitely be back next time we visit Edinburgh. Our visit to Edinburgh was really enjoyable also thanks to the first class service at Six Brunton Place.Staff were really gentle and helpful, place really beautiful. We would definitely visit again. Our four night stay gave us the chance to test the No 1 position in Edinburgh which Six has achieved on Trip Advisor. All that we need to say is that the top spot is not in danger. Outstanding in all respects. We thoroughly enjoyed our stay and would highly recommend Six Brunton Place. The service was fantastic from the personal welcome to the wonderful breakfast. The room was great and very comfortable not to mention the modern bathroom. We were travelling with our children and their friends(14,14,17,17) and we all lovedSix Brunton Place,everything was perfect there,warm welcome, excellent breakfast,very nice and clean and comfortable rooms,Sue was very helpful in making reservations for dinner and had excellent tips,where to eat and what to do,we really felt at home!Thank you so much! By far the nicest place we stayed in during our two week trip around London and Scotland. Fabulous hostess, lovely room and bath, plenty of space for the three of us and amazing breakfast. Would highly recommend and would definitely stay here again! Loved every minute! !We stayed as a group of 6 for my hen night so we had the whole place to ourselves which was great! !Sue was the perfect hostess and couldn't have done more for us! Nothing was too much trouble!The B&B itself was beatutiful and perfectly clean and tidy! The rooms were gorgeous, all en-suite with fantastic bathrooms!The complementory wine in the lounge and flapjacks in the rooms were all lovely little finishing touches as well! And the B&B was perfectly located!Would definitely recommend and I'm already looking in to coming back!Thank you!!! 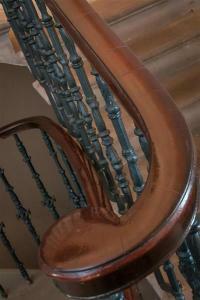 We stayed with Sue at Six Brunton Place about a week ago and had the most amazing time. 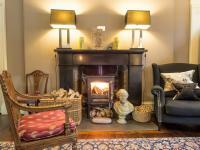 During our time in Scotland we stayed at a few B&B’s, but Six Brunton Place was by far the best accommodation.During our stay it was extremely cold so it was a brilliant gesture when Sue welcomed us with freshly brewed coffee and delicious baked treats in the beautiful front room. Sue is extremely helpful in explaining where all the tourist attractions are and really makes you feel like you are staying with a friend rather than a B&B. The breakfast was absolutely delicious and I could see that a lot of effort went into the preparation. We stayed in the Regent room for our first night and it was a spacious beautiful room with a lovely bathroom that had both a luxury bath, shower, underfloor heating and a heated towel rack (just what we needed for the chilly evenings and mornings). It’s the little touches that make Six Brunton Place so special, from the complimentary wine, chocolates in the room, dressing gowns on your bed &gorgeous complimentary toiletries. Staying at Six Brunton Place will definitely make your trip! Absolutely beautiful! Will be coming back. Sue is a wonderful host, and couldn't make you feel more welcome. We stayed in the garden room which had heaps of space and was totally luxurious. Child friendly - sue even offered our two year old son rubber duckies to use in the bath! Loved staying here, and wish we had longer. This is the best B&B we've been to in ANY country!Every detail has been thought about and executed to perfection.We will be back! This was our first time and it certainly won't be the last. A wonderful stay from beginning to end.Sue is a marvellous host, attentive but not intrusive.We were given a guided tour of the house before being taken to our gorgeous room. Lovely big comfy bed and a bathroom to die for! Lovely homebaked goodies to be had along with the tea, coffee etc.There was also an 'honour' bar with wine if you fancied, in the Dining/Lounge room.This was a lovely touch which we enjoyed after a lovely day out.Breakfast was a relative feast with a wonderful choice of cereals, yoghurt and fresh fruit and juices to start. Then a choice of hot food too. Difficult to decide what to have, but managed... Delicious fresh sourdough bread or toast to accompany.You can see why this is the NO. 1 Guest House in Edinburgh. First Class. Did not disappoint - the perfect B&B experience! Opted for a guest house on our second visit to Edinburgh and stayed in this beautiful Georgian house. We stayed in the Regent room which was lovely and warm and comfortable with a Super king bed. An en-suite to die for with a fanastic rain shower, could have stayed in there for hours! All sheets and towels are from the White Company so real luxury. Lovely breakfast with all on offer which include cereals, fruit salad, freshly squeezed juices, ice water etc.. Full Scottish can be order and you won't be dissappointed. Other hot food can also be order and the smoke salmon with scrambled eggs is also delightful. Great coffee and tea. 5 Star accommodation for a fraction of hotel prices. From the moment I made the booking to stay at Six Brunton Place over a month ago I was so impressed by the incredibly accommodating and warm manner of the owner Sue. My stay there made my trip to Edinburgh even more fantastic. The room was 5star - very comfortable bed, fabulous bathroom with divine deep bath, and lots of extra luxury details such as bath robes, green and black chocolates, home made flapjacks,provision of DVD films to borrow..Every need and more catered for. As for the breakfast - utterly delicious!I cannot recommend this guest house highly enough and simply cant wait to return. I stayed two nights with my teen age daughter. The bathroom was excellent;optimal water pressure in the shower! Even if the rrom was small, the bed was comfy and there was coffe, tea, chocolate and bisquits at no extra cost. The served breakfast was wery tasty;both the light and the Full Scottish! I would highly recommend staying in this guesthouse. Also, the landlady was very friendly and service minded. From the moment we walked through the door we were looked after!This is a super guesthouse in a convenient location for the city. Sue is incredibly helpful;nothing is too much trouble.We will definitely return! OUTSTANDING B&B! !The location, decor, food, and services were all excellent and Sue was an informative, supportive proprietoress.The attention to detail eas noteworthy!We thoroughly enjoyed our stay and will definitely return! This is a warm and inviting guest house. Sue and her family will do their utmost to be sure you are comfortably settled into quiet, clean, tastefully decorated rooms. You cannot do better at any price. Even Maxi, the quiet family dog, will make you welcome, but only if you ask to meet him. Go and enjoy. We plan to return soon. This is our second visit in under twelve months. On our first stay we were very impressed with the standard of accommodation and quality of customer care. At this, our second visit, all of our initial impressions were confirmed and we are happily surprised at their ability to retain such a high and consistent standard. No.6 is a joy.